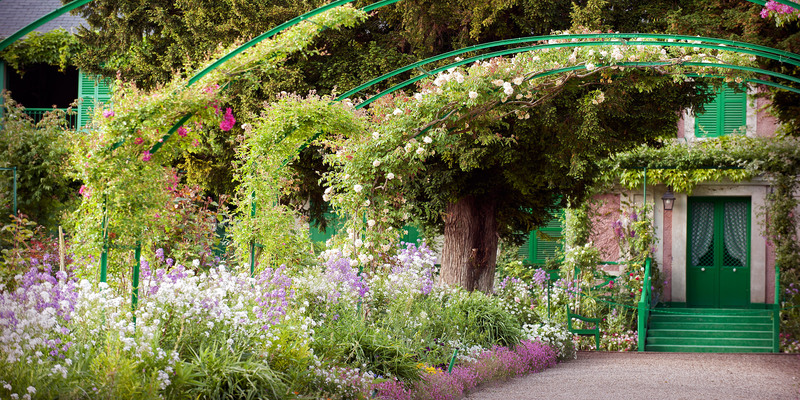 When Monet settles in Giverny, the long, pink stucco house has a one hectare garden comprising an apple orchard and a kitchen garden. A wide path lined with cypress and spruce leads from the gate to the main door, the flowerbeds bordered by trimmed box trees. Enthralled by this garden, the painter-gardener immediately sets to work, never ceasing , thereafter, to improve the « Clos Normand » and to make it the garden of his colourful dreams. Passionate about gardening , the painter applies his pictorial knowledge to creating perspectives, highlighting the house and intensifying areas of shade. On the left side of the garden, he creates rectangular beds of single colours, ressembling so many colours set out on an artist’s palette…. As inventive in his garden as in his painting , this ‘man so crazy about flowers’, created a solar garden which, thanks to the talent of the current gardeners, displays its magic every year.